On November 4th BMI proudly presented the 2014 BMI Country Awards, honoring the prolific songwriting career of BMI Icon Vince Gill, as well as the Country Songwriter, Song and Publisher of the Year tonight in Nashville. The 62nd annual event, which is the genre’s oldest awards ceremony, also celebrated the songwriters and publishers of the most-performed country songs of the past year. BMI President and CEO Mike O’Neill hosted the ceremony with Jody Williams, BMI Vice President, Writer/Publisher Relations, Nashville; and Clay Bradley, BMI Assistant Vice President, Writer/Publisher Relations, Nashville. 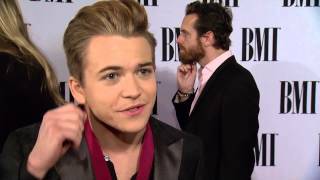 ... Hunter… Read more... ... Hunter Hayes: Hunter Hayes Interviewed at the 2014 BMI Country Awards. Captured at 2014 BMI Country Awards. More Videos. Roster. Hunter Hayes Is Far From 'Invisible' at the ACM Awards 2014!